When you’re releasing something on the PC—whether the target system is Windows, Linux, Mac, or something else entirely—you’re never quite done with it, even when though the game is already out and everyone can play it. Thanks to the fact that each computer is so different from the next, and the sheer amount of players you have to find them, there’s bound to be a bug or five hundred somewhere. Annoyingly, they can often be quite serious, causing a game that someone has paid good money for to crash and prevent them from playing at all. Because of that, I’m committed one hundred percent to maintaining Another Star after its release. If there’s a problem with the game, I’ll try my best to fix it (within reason). And not just at release, mind you. For at least the next five years, whatever happens to Vision Riders, whether the company sinks or swims after the game comes out, I’ll personally continue to put out update patches to make sure that what you paid for actually runs. It doesn’t mean as much coming from an indie developer, perhaps, but this commitment is something I take seriously. If I was big on marketing I’d call this the “Five Year Guarantee” and make a cool logo for it, but that’s just too much work I don’t feel like doing today silly. And speaking of after release, a few people have either suggested that I look into getting the game translated into other languages, or have even offered to help do so themselves. I would absolutely love this, because I want the game to reach as many people as possible who want to play it. The game’s underlying engine is even set up to just start plugging translated dialog in with the change of a simple text file. But, well, there’s a problem with translating this game. Can you spot it below? A slightly dated version of Another Star’s 256 tile sheet. Every single sprite in the game comes from this image. 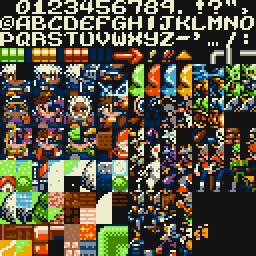 The problem is very simple: because I’ve limited myself to only 256 tiles, there’s only a set number of characters that can fit into the game. Notice how the game only includes capital letters, saving 26 tiles that would have been used for lower-case letter and can now be used for other graphics. Most other languages, even those that use the Latin alphabet, have a number of additional symbols (like accents) that standard English does not contain. Sure, you can use different tile sheets for different languages, trading out characters that the target language does not need, but a lot of languages are going to need more than just the 26 tiles used for the English alphabet. Ironically, the solution to this is equally simple. Simply “cheat” the 256 tile limit for non-English languages and enlarge the tile sheet to include new characters. (For languages like Japanese, even if you’re only using hiragana this would be an absolute necessity.) Problem solved. But wait! If we’re going to cheat and expand the tile sheet anyway, leaving all that extra real estate for tiles, why not put some of those new tiles to use? What if there was a “special edition” or “rerelease” of our imaginary Another Star game cartridge that included extra memory for foreign releases, and used some of that extra memory for new enemy graphics, new map areas to explore, and countless new things to do and see that weren’t in the original release? In other words, post-release DLC. It’s something I’ve considered for a long time, and even have some ideas on what to include. If I went this route, I’d like to keep the DLC packs small and free of charge. In other words, if you buy the game, any of these updates will be included in the price. I’ll probably even include some sort of switch so you can stick with the “pure” 256 tile release version if you want. Granted, the free DLC would (probably) not include something like a complete enemy graphic overhaul to make the enemy sprites bigger and more varied, or an HD graphic pack with higher resolution and more colors. While those things would be cool, they’d likely take months of work to complete and it would be difficult for me to justify handing them out for free, supposing I’m able to do them at all. Still, it’s something to keep in mind. Regardless, I hope this gives you something to look forward to. I want to make sure the money you pay to play the game feels like money well spent! Another Star is nearing release as we speak, so you’ll be able to get your hands on it before long. Today I learned that my sister’s wedding is taking place this October, not next October the way I had originally understood. In fact, it’s taking place the same week as Another Star ‘s scheduled release date. Even though it’s not like I’m planning the wedding or undertaking its execution, considering the stressful amount of post-release bug-hunting and publicity I expect to have to keep on top of, 21 October is just not going to work—especially if I’m on the road that particular day driving my grandparents up here! This leaves me with two options. While this gives me more time to polish and promote the game, it also presents all-new problems. It’s looking like I’m going to be moving sometime before the end of the year, probably in November, and there’s no way I’m going to do a move and a game release at the same time. Not to mention moving the release even closer to the end of the year puts it in conflict with year-end sales at places like Steam and GoG.com. I’m not sure how a low-profile release like mine would fare when people are busy saving their money for snagging titles bigger than mine at 80% off. So, early next year then? That’d give me time to do additional cool stuff like a Nintendo Power style strategy guide in PDF format, akin to the kind they put out for Final Fantasy and Dragon Warrior on the NES back in the day. But that’s also really postponing a project I’m ready to be finished with. The fate of Another Star and what comes soon after—if anything—is seriously going to determine whether Vision Riders continues to exist in any form. I’d rather get that over with sooner than later. Which leads me directly to the next option. It’s a possibility, but it’s a slim one. I could move the release date forward by a week or two. I’m not particularly fond of this option. 21 October is already a close shave as it is. September is nearing its halfway point, and I still have the last dungeon, final boss, and ending to design and code. I would have precious little time left to refine the script, get playtesting feedback, fix bugs and typos, and do all the promotion a title like this needs to get noticed. Still, it is a real possibility, and one I’m seriously considering. Once the fate of the game’s release is known for sure, I’ll post about it here. Until then, assume the game is coming out later rather than sooner. I’m really sorry about this. If the game gets delayed, I’ll try to find some way to make up for it. Items are very important in Another Star , in no small part because they’re just about the only way to heal your party. Making sure you have enough Herb Dust on hand before setting off into the next dungeon is essential to your survival. For most of the game’s development, using items was the same as any other battle command, and the item would get activated whenever the party leader’s turn in battle came around. Turn order each round is based on a combatant’s agility stat, but it’s not fixed. While faster characters have a higher chance of going first, it’s still possible for a slower character to get a lucky RNG roll and get a move in before them. Because of this, it was common for the enemies to whittle your party’s HP down in one round, and then finish you off the next round before your party leader’s turn came around to heal everyone. This problem was only made worse by the fact that Tachi (the main character) is your party leader so long as he’s up and fighting—but Tachi is by far the slowest character in the party. This means that he often goes last each round of battle, making him the worst possible candidate to use an item. But the player had no choice in the matter. 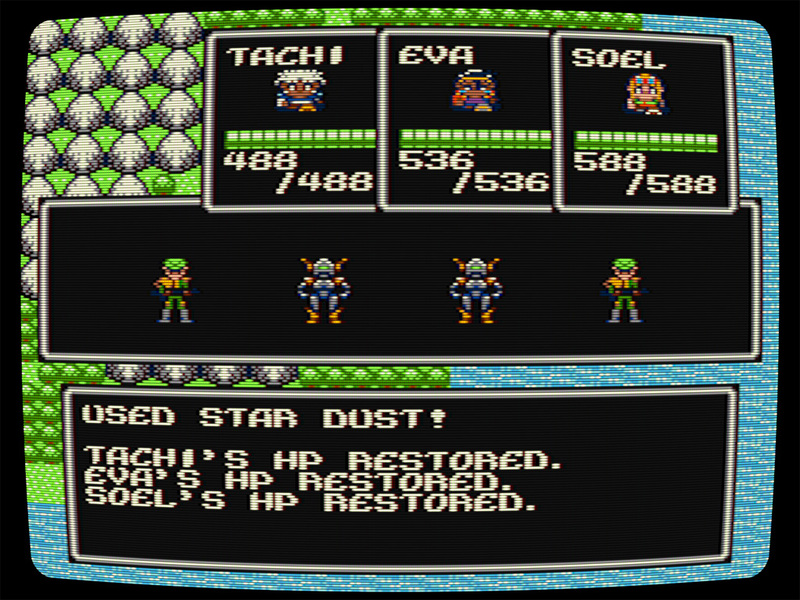 Unless Tachi was knocked out, he would always be the one using the item. This led to common situations where the entire party would go from over ⅔ health to dead before the player could get a healing item in, even if they were perfectly leveled and equipped for the area. You’d get wiped out before you even had a chance to react! I realized that this wasn’t fun at all. There was no strategy to it, just luck. So I began to think about ways to address it. One solution was to average all the character’s agility and use that to determine when the item got used. But that seemed arbitrary and counterintuitive, so I came up with something better. In the current version of the game, if you decide to use an item in battle, you will always go first. It’s actually worked out pretty well. It’s made limited-use attack items like bows and throwing stars even more valuable, since they’re guaranteed to deal damage before the enemy can attack, and it’s also given battles a bit of a gamble mechanic because you can decide to risk letting your HP drop very low, knowing that so long as they don’t get knocked out you can heal the party right back up again. Thus if you get killed, it’s usually because you flew too close to the sun in your gamble, not because of the whims of chance. Even though it seems battles are just there to slow you down and pad gameplay time, please remember that they’re actually a core part of the game experience, and because of that a lot of thought went into them.